Pinterest makes money by selling advertising for marketers and companies that can gain visibility for their brands and more sales for their shops. In 2018, Pinterest made over $755 million in advertising revenue, and it had 250 million monthly active users. The foundation of any business model needs to be built on top of a solid value proposition. That’s why we’ll start from breaking down Pinterest value proposition. However, for digital businesses and in general for organizations built on top of more elaborated business models, there will be a few key players that make that business model viable in the first place. The Pinterest mission is “to help people discover and do things they love.” Let’s see how it accomplishes that. Who are Pinterest key customers? 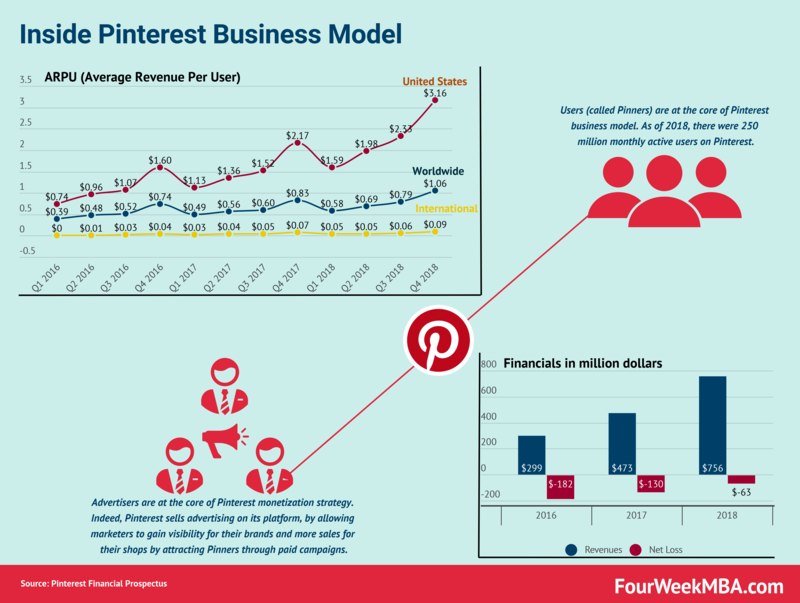 Who is a Pinner and why it matters for the Pinterest business model? Pinterest is where more than 250 million people around the world go to get inspiration for their lives. They come to discover ideas for just about anything you can imagine: daily activities like cooking dinner or deciding what to wear, major commitments like remodeling a house or training for a marathon, ongoing passions like fly fishing or fashion and milestone events like planning a wedding or a dream vacation. Pinterest calls those people “Pinners.” The whole experience of Pinners moves around visual recommendations, which are called “Pins.” Those Pins are customized, contextualized and organized around interests, within boards. Pinners get the service for free. They don’t pay a dime. However, the whole Pinterest business model is built on top of its Pinners. They are at the core of the Pinterest business model. Advertisers instead are at the core of the Pinterest monetization strategy. Let’s see why both Pinners and advertisers stick so far to Pinterest. Pinterest value proposition needs to offer compelling reasons for both Pinners and advertisers to keep coming back to the platform. The value proposition for Pinners moves around four key elements. It is essential to remark how Pinterest wants to position itself differently from other tech giants like Google and Facebook. In 2014, Pinterest introduced advertising to its platform. Initially, Pinterest focused on large organizations with large marketing budgets. As the company grew, it also adapted its sales force and available tools to advertisers to allowed smaller organizations to take advantage of Pinterest advertising platform. That also made its revenues scale fast. At this stage, Pinterest is also focused on building a stronger international digital advertising platform. Indeed Pinterest is in the digital advertising business. Therefore, its competitors are companies like Google, Facebook (Instagram as well), and other companies offering digital advertising opportunities. Pinners travel across this funnel that goes from inspiration, organization, and action. Advertisers can put their content in front of this audience and work from the top to the bottom of the funnel, thus, from awareness to conversion. Pinterest focuses most of its effort in allowing users, its Pinners, to curate and handpick content. Pinterest focuses on making this curated environment thrive. Therefore, the majority of Pins get handpicked, saved and organized by its user base. Those Pins are then matched with billions of boards to form the so-called Pinterest taste graph. This helps users refine and find the visual content they’re looking for. It allows Pinterest to anticipate the tastes of its users. And it also makes it easier for advertisers to attract the attention of Pinterest users through paid campaigns. Pinterest makes money by selling advertising to marketers and companies that want to gain visibility for their brands and want to drive sales to their websites. In 2018, Pinterest made over $755 million from advertising.